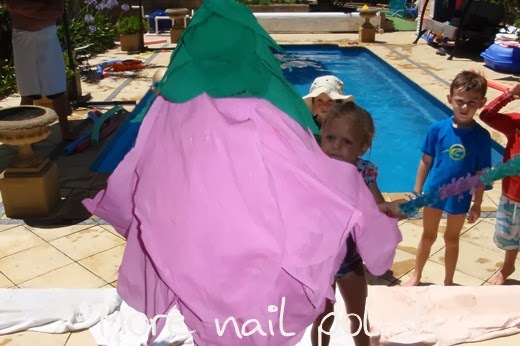 Last year, when my little miss turned two, I created some very pink nails, which I said were about as pink as I could go. It turns out I was wrong, I could go much pinker. 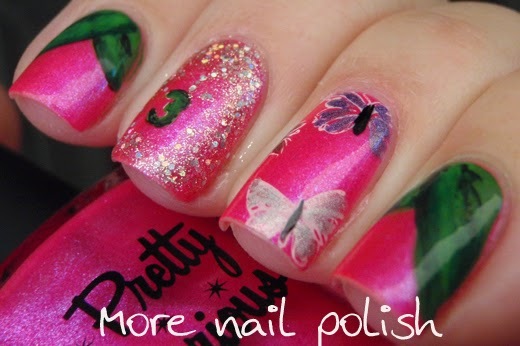 Last year Pretty Serious Cosmetics released an amazing pink polish, aptly called 'The Pink One'. 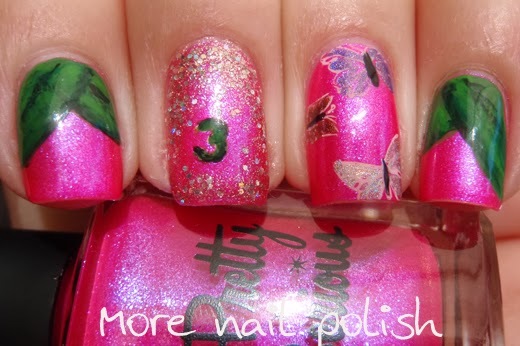 I just had to wear this polish for my daughters 3rd birthday, especially as one of her nicknames is 'Pinky'. 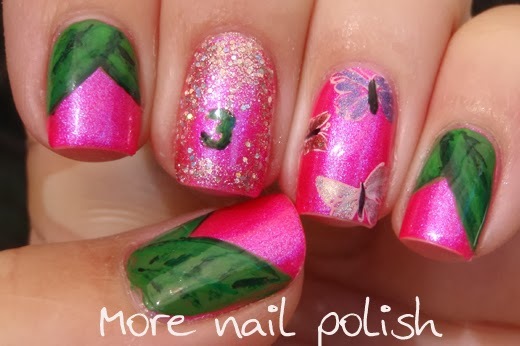 I started this mani with three coats of PS The Pink One, I then free handed on some green leaves and the number three. I stamped some small butterflies and painted them in some holographic polishes and I outlined the number 3 with OPI Teenage Dream. I did my nails to loosely match a few things from her party. 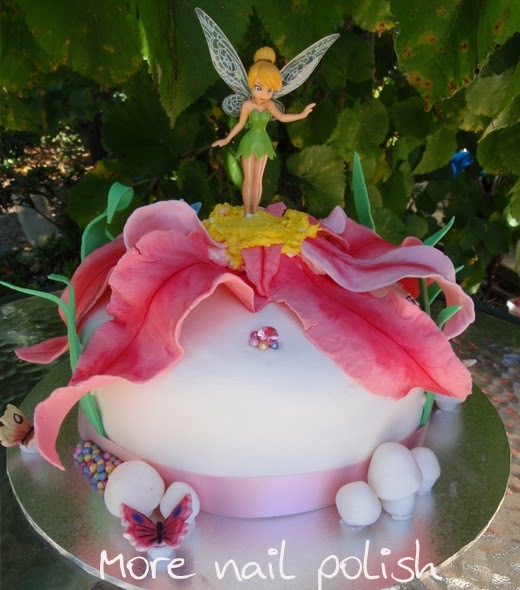 It was Tinkerbell themed, we had a pink flower pinata and there were butterflies on her cake. I was very pleased with myself and my baking/cake making efforts this time. 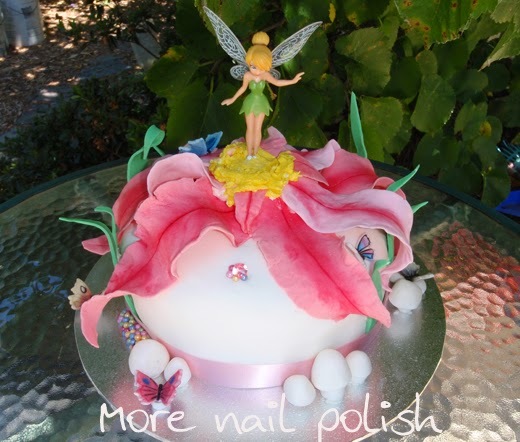 I googled for some inspiration of TinkerBell cakes and found some awesome cakes for guidance. It was a double layered chocolate and caramel mud cake with marshmallow fondant and sugar flowers and butterflies. This year we had her party on the day, during the week, mainly because most of my family will be off on holiday's and my husbands baseball commitments. It was 37°C (99°F) yesterday (and was 40°C (104°F) today!) but it didn't feel too hot, as we were all in and out of the pool. 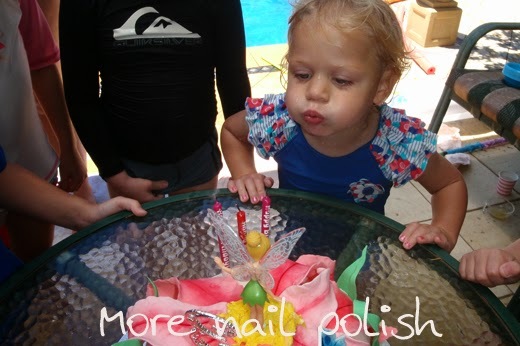 I suspect she will have many a pool party for her birthday in years to come. 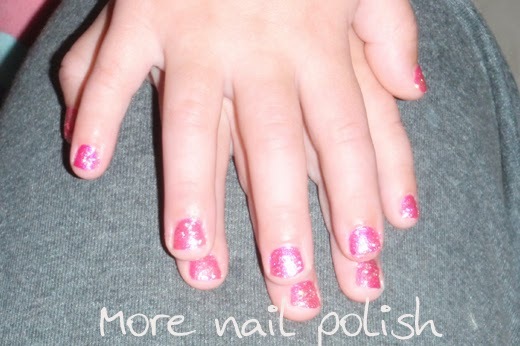 I did paint Skya's nails too, using The Pink One and OPI Teenage Dream. Pink and sparkely - exactly what she wanted. To top off a very busy day, in the late afternoon we headed down to Wollongong for the night to go see the Disney Magic Stage Show. They were both so amazed with seeing Micky, Minnie, Donald and Goofy in real life and the magic tricks blew their minds. Here are my two munchkins at the hotel just before heading to the show! 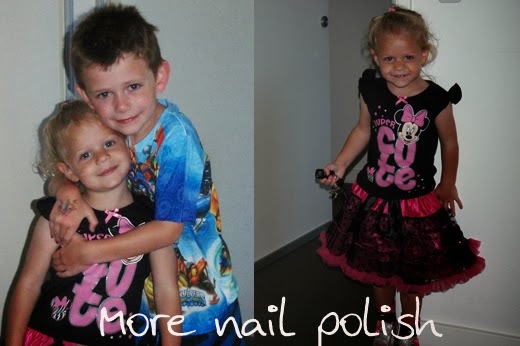 Thanks for putting up with the non nails stuff! Fabulous cake! Pool party sounds perfect... this heat is amazing!